The Wurlitzer was originally installed in the Ritz cinema, Stockport as a three manual eight rank instrument. 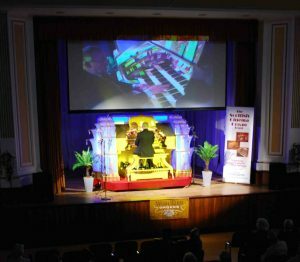 The Scottish Cinema Organ Trust (SCOT) installed it at Clydebank Town Hall where it was given a Civic Opening by Doreen Chadwick in September 1998. Unfortunately, after being repeated damaged by flooding from the river Clyde, it was removed from the Town Hall. Since then a great deal of work has been carried out to repair the damage and the organ is now installed in Pollokshaws Burgh Hall.